John Neal’s parents married during the second world war. The bride, Winnie, was the daughter of Mrs Wootton of Chapel Cottage and the groom, Fred Neal, was the son of Mr and Mrs Walter Neal of Manor Farm. 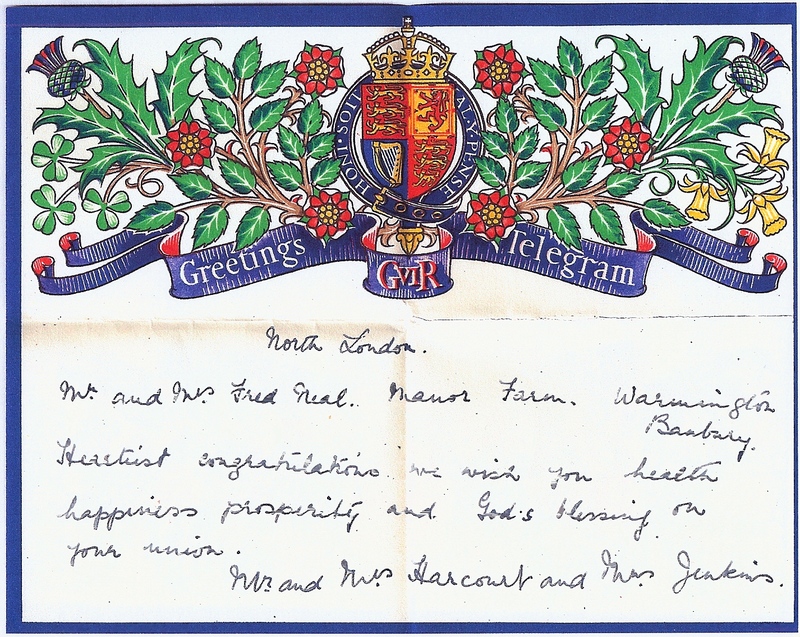 Several Greetings Telegrams arrived on the happy day. reception in the village hall. Tablecloth, Phyliss – husband Ernie (Fred’s cousin) killed during the war. 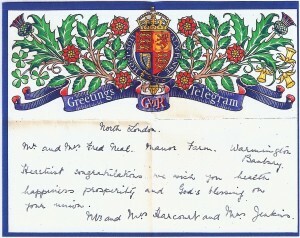 Cheque and silver, Mrs Jenkins – Fred’s mother was a lady’s companion to the Misses Jenkins before her marriage to Fred’s father. The headdress and veil were borrowed from her sister-in-law, Elsie, (George’s wife). The journey to Weston-super-mare for their honeymoon wasn’t easy as all signposts had been removed! Their first home was at what is now known as ‘Little Dene’, Warmington.